Project girl band IZ*ONE dropped Monday a new album, “HEART*IZ,” another flower-themed record after their record-setting debut EP last year. The release marks the 12-member Korean, Japanese band’s return to the K-pop scene after their Korean debut album, “COLOR*IZ,” made history in the Korean and Japanese pop scenes in October. The new eight-track album is fronted by “Violeta,” another flower-titled main track following the debut album’s “La Vie en Rose,” which used the color red in its lyrics, music video and stage performances. The main track of “COLOR*IZ” topped two Korean weekly K-pop competition shows and sold more than 80,000 copies in the first week of its release, the highest record for a K-pop girl band, bringing the band five Rookie of the Year awards. The same album also topped Japan’s weekly Oricon album chart and weekly digital album chart, before their Japanese debut album, “Suki to Iwasetai”, released in February, was certified platinum by the Recording Industry Association of Japan in March after selling more than 310,000 copies. “The Happy Prince,” a children’s story by Oscar Wilde, inspired “Violeta,” which features IZ*ONE members as the story’s swallow that takes ruby, sapphire and gold from the statue of the prince and gives them to the poor. 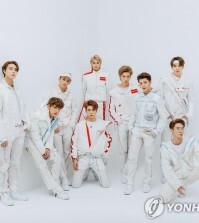 Likely to repeat its debut success, the band has already sold more than 200,000 copies of “HEART*IZ” in pre-orders and topped Japan’s Tower Records chart for online pre-orders, according to the band’s management agency, Off the Record Entertainment. The song starts with future bass sounds in the intro to fuse the pop and tropical house genres. “The album title is a combination of the word heart, which means love and mind, and IZ, (pronounced eyes) part of the name of the band,” member Jang Won-young said in a press showcase of the album held in Blue Square in central Seoul. 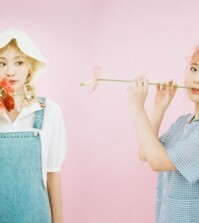 “We have been grateful for the love we received with our debut album last year, and with this album, we want to entertain WIZ*ONE with frequent stage performances and appearances, rather than seeking to take No. 1 (on the charts),” Won-young said, referring to the band’s fandom. The album includes Korean adapted versions of two IZ*ONE songs previously released in Japan, “I want to be a cat” and “Good bye.” Member Kim Min-ju adapted the first song into Korean while the second title was adapted by another member, Lee Chae-yeon. The fifth track, “Airplane,” is created by Lee Dae-hwi, the prolific former number of the disbanded boy band Wanna One, which debuted through Mnet’s “Produce” idol competition show series, as did IZ*ONE. The third track, “Highlight,” is an extension of “Violeta,” according to the members. “If you listen to the album in order, from the first track to the last, you can grasp a consistency (that runs through the album),” member Kang Hye-won noted. Sakura Miyawaki, one of the three Japanese members, partly wrote the lyrics for the fourth track “Really Like You” along with Min-ju. “We are planning stage performances where we can communicate and have fun with our fans who support us,” Sakura said. With the new album release, the 12-member band is also slated to throw their first solo concert in June, the members noted.